My dear friend Mary was in town last month and she emailed me weeks before and asked where we should go eat. A woman after my own heart. :) She gets a kick out of getting mentioned on my blog, so she wanted to make sure we went somewhere that I hadn't been and could blog about. I told her how Jung came to visit a few weeks back and how he loved Italian Beef sandwiches. 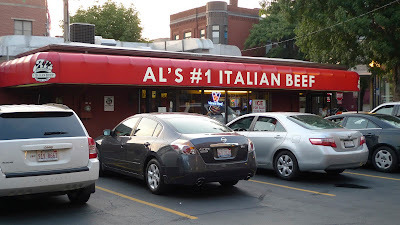 Mary never had one before so we thought we'd try Al's #1 Italian Beef in Little Italy. It's been on Food Wars and Man v. Food and is often pitted against Mr. 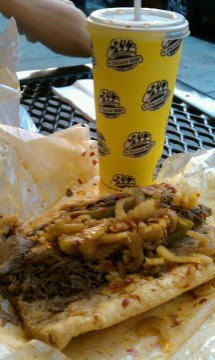 Beef for the title of Chicago's best italian beef sandwiches, so I thought it warranted a visit. It's one of the few places on Taylor Street that has a parking lot. You walk in and you're basically in their kitchen. There are no tables inside, just a counter along the side of the walls where you can eat your sandwiches standing up. Thankfully the weather was nice and there were three picnic tables outside, so we ordered and took our meal outside. Mary and I both ordered a regular Italian beef sandwich with hot peppers, and of course, dipped in gravy. According to their website, gravy on an authentic Italian beef sandwich is not the thick stuff you pour over your turkey and mashed potatoes, but a thin, highly seasoned, aromatic beef juice that is often used to dip the whole sandwich in. Granted my only other taste of Italian Beef sandwich prior to this was at Joe Boston's and Hoagie Hut, I have to say that there is not an Italian Beef sandwich that I have met that has looked the same. Each place does theirs slightly different. I guess that was what kept Jung going on his mission. I couldn't figure out how he could eat so many italian beef sandwiches, but they are all slightly different and it's pretty fun trying to discern the best of the best. After unwrapping our precious cargo, we were confronted with this. Here's a closeup of their Italian Beef Sandwich. Note the juices that are all over the wax paper. I asked for both sweet peppers and giardiniera. They make their own giardiniera, which is pickled celery in a spicy oily blend. It wasn't nearly as spicy as some of the other giardiniera that I've had. Although usually I have to resort to fanning my mouth to keep from crying, I am addicted to this stuff. Al's didn't quite do it for me. I was hoping for more of a kick, but it was pretty mild, despite the red chili flakes in this. I think what makes Al's different is definitely the spices in the gravy. The spice blend is a secret, but I definitely tasted coriander in this. It's more aromatic than the others that I've had. Some may prefer it, but I thought it detracted from the beef taste. I tasted more spice, than beef. 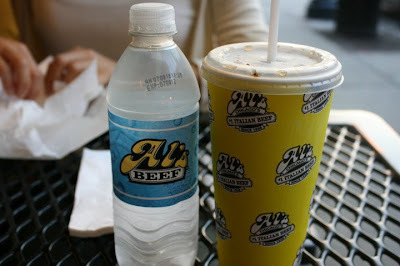 The guy at the counter was super nice and told us about the history of Al's, which I have since forgotten (sorry!) but he talked about how they are in the process of franchising some stores outside of Illinois, but how it's dependent on where their suppliers are, because the quality of their product is key for them, so they won't open any franchises where they won't be able to guarantee the quality of their ingredients. They just opened a franchise in Scottsdale and are in the process of opening a store in Georgia as well. 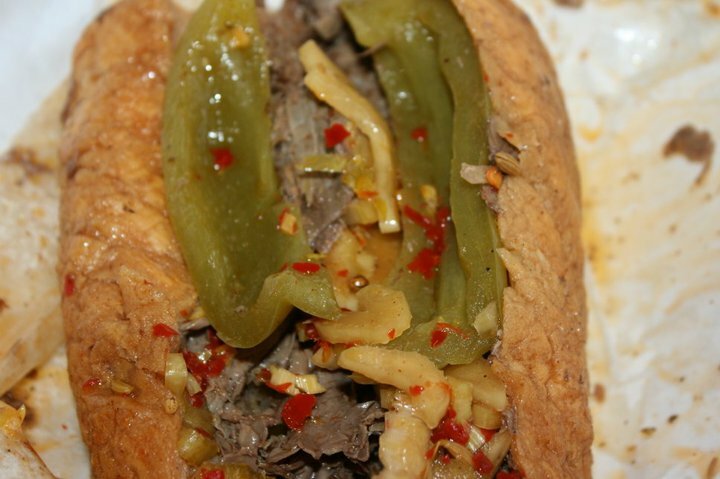 Did you know that they also ship their Italian beef sandwiches all over the country as well? So if you want to taste it for yourself, give them a call and they will be happy to ship you your very own Italian Beef Sandwich kit. omg, how do you post so fast?